My first proper photograph taken on a Zeiss Ikon bellows camera that my father gave me because he had moved on to super 8 cine. Thanks to Frazer P we now know this is Varazze in about 1965 or 6 and the statue is not the Madonna but SANTA CATERINA DA SIENA when she was on point duty, directing traffic. I have since read that the statue was inaugarated on 16 October 1966 so I must have taken the picture in 1967 when I was 15 years old. 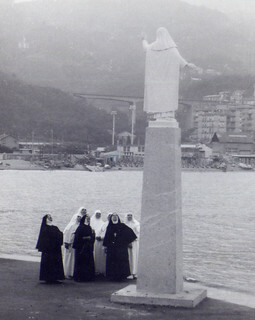 the statue was later removed whilst the port was enlarged and then the statue was repositioned at the entrance to the marina in 2007 on a shorter plinth.